Do you love science and like to write? 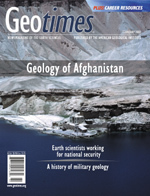 A geoscience fellow finds her expertise all too relevant. ON THE COVER: The Band-i-Haibat is one of the largest self-damming lakes of Band-i-Amir (Dam of the King) and sits in the Hazarajat area of central Afghanistan. The Hazara people believe that Mohammed’s son-in-law, Caliph ‘Ali, built the eight tufa dams and lakes of Band-i-Amir for drought relief. 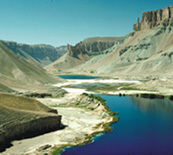 This lake is located near the Bamiyan Buddhas that the Taliban destroyed last March. Photo provided courtesy of Jack Shroder, University of Nebraska. Read story.